Handcrafted candleholders with marble base. Natural brass and white enamel trim. Set of two handcrafted candle holders. Goldtone. Set of two candleholders. Natural oxidized brass and white enamel detail. Black marble bases. Berlin candle holders. Steel x-base with mod circle cutouts and brass-plated sphere. Handcrafted Dogwood candleholders, set of 2. 3"Dia. x 11"T. Crafted of brass plate and marble. Handcrafted candleholders. Nickel-plated and black nickel-plated metal. Handcrafted candlestick holder. Hand-painted majolica earthenware. Dishwasher safe. Handcrafted candlestick. Made of enameled steel; bronze accenting. Hand painted. Handcrafted candlestick holder. Heavy gauge hand-glazed steel under body. Hand-painted Courtly Check details. Rimmed in bronzed stainless steel. A golden metal branch curves above a clear glass globe designed to hold a pillar candle. Aluminum, glass, and marble. 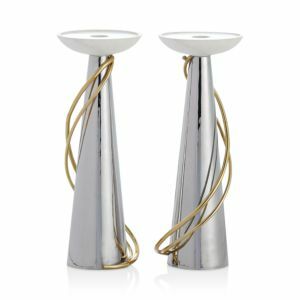 Vera Wang Wedgwood's Love Knots candle holder pair combines a lustrous gold- and silver plating with a tall, eloquent design. Porcelain candelabra. Set of two handcrafted candle holders. Nickel-plated. Gleaming crystals reflect candlelight's warm glow in the elegant candle holders of the Godinger Lighting by Design Crystal Collection. Handcrafted candelabra. Nickel-plate aluminum. Set of two goldtone candlestick holders. Perched on marble bases. His "Gold Orchid" collection illuminates the ethereal spirit of the orchid flower. Evocative of happiness, strength, joy and resilience, this version offers a strikingly unique appeal. Inspired by the purity and innocence of the calla lily flower, this romantic collection is highlighted by delicate floral-inspired silhouettes juxtaposed by lustrous metal backdrops. Four, handcrafted giant irregular cubes of crystal create this stunning candleholder. 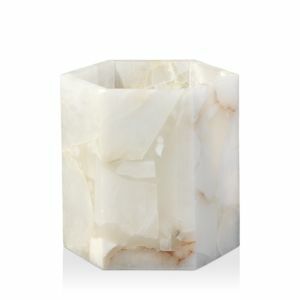 Five, handcrafted giant irregular cubes of crystal create this stunning candleholder. Three, handcrafted giant irregular cubes of crystal create this stunning candleholder. This set of two candleholders brings a warm touch of gold and character to a table setting. The hammered finish was inspired by a similar surface on a family frame. Equal parts classic and modern, these New England ash candlesticks set the scene for a sophisticated tabletop, no matter the occasion. Handcrafted brass candle holders. Set of four. Handcrafted beeswax dinner candles. Hand-rolled and decorated. 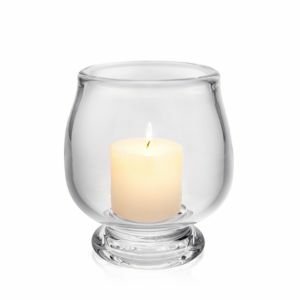 Hand-blown smoked glass candle holder with decal applied platinum rim around top edge. Holds up to a 4"Dia. pillar candle. These beautiful over scale lead crystal candleholders are as impressive as they are interesting. Designed to complement each other, the polished crystal blocks also stand alone as stunning sculptural statements. Each candleholder is wrapped in a black fabric bag and packed in a polished white gift box. These beautiful over scale lead crystal candleholders are as impressive as they are interesting. Designed to complement each other, the polished crystal blocks also stand alone as stunning sculptural statements. Each candleholder is wrapped in a black fabric bag and packed in a polished white gift box. Artfully sculpted expressive hands are realized in fine Portuguese ceramic. Each hand is sold individually. Holds a 4"Dia. pillar candle. Solid crystal and antiqued brass candleholders. Set of three. 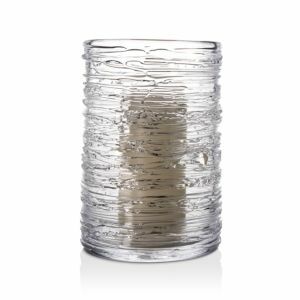 Solid acrylic column is highlighted between two nickel plated cups with a glass hurricane and a nickel plated rim to add a touch of elegance to your candles and interior. Holds a 4"Dia. pillar candle. Beautifully crafted golden candleholder. Aluminum and glass. A silvered glass shade is surrounded in woven hand cast brass vines making this is a truly memorable and versatile piece. This set of three brass candle holders present an updated modern twist to a pillar candle holder. The varying heights allow for an interesting display of form and function. Hand-painted candle. Paraffin/palm wax blend. Make every day extraordinary with Courtly Check Enamelware. If you're thinking "classic" as in black dress and pearls, or white tie and tails? Think again! We've added sass to the traditional color combination in our signature color-dragged, hand-painted pattern. Dressed up and styled out, it's black and white our way. Very classy with a kick! Hand-painted candle. Paraffin/palm wax blend. A fresh take on a classic design, our Maxwell Lantern has a tall, slender silhouette for an elevated look. With its aged-bronze finish, it looks just as elegant atop a console in the entryway as on a coffee table in the patio. Handcrafted beeswax pillar candle. Hand rolled and decorated. Handcrafted in a classic silhouette, the Chester Lantern features a softly curved top and a rounded handle. A brushed antique-brass finish adds just the right gleam to this decorative lighting essential. A classic style that has stood the test of time. 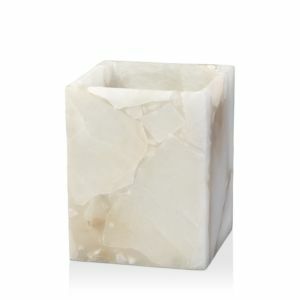 Designed to add a touch of soft light to any table, counter or mantle. An elegant way to keep pesky bugs at bay on warm summer nights. With 5 citronella incense cones inside, this beehive burner lets off a gentle aroma to drive pests away. Dine al fresco, relax by an outdoor fire, or sip cocktails on the patio in peace. This handy little piece allows you to strike matches directly on the specially-blended stoneware, adding a practical and beautiful element to any home. Textured aluminum lantern. Perforated conical body. Top rope handle. Handpainted iron Shards of clear selenite encase a glass votive which appears to float over a crystal base. Handcrafted glass votive in folded design. 24-karat gold accents. An update on tradition, this duo of mini-hurricanes is styled with a short stem and flared lip, with a vessel to fit a votive candle. Wrapped up in a custom gift box, these make a perfect gift. Hurricane handcrafted using centuries-old techniques. Inspired by Paul Revere's iconic silver bowl. Pure lead-free glass 3"Dia. pillar candle included. Dishwasher safe. Made in the USA. This luminous hurricane by Simon Pearce is expertly crafted by master glass artisans using techniques that have been passed down over centuries. Designed for use as a hand-blown, clear glass candlestick or as an angular bud vase, this design is a versatile two-in-one. Inspired by wood shapes turned on a lathe, the curvy silhouette changes from one use to the other with just a flick of the wrist. Each spherical Hartland silhouette is made by two glassblowers working in tandem. A signature of our brand, a pair of these popular taper candlesticks makes an ideal gift. Fans of our signature glass pineapple inspired us to add another way to bring this icon of warmth and hospitality to the table. The same eye-catching texture and style as the original, but with the added functionality of a candlestick holder. A unique way to light up the night. These votives serve as the ideal vantage for the reflecting candlelight.